Has the raw food movement got you wondering? Here is a nice example of a totally raw dessert treat to serve your family or guests and get the conversation rolling! Wait. What? No-bake apple tart? No bake tart? Seriously? One of the burgeoning movements in the plant-based diet realm is the raw food movement. “Raw” is arguably the best way to capitalize on all the nutritional value of the fruits and vegetables that make up a plant-based diet. But the whole idea of raw food, even fruits and veggies, is confusing to some and just plain objectionable to others. The truth of the matter is that you don't have to eat cold food for the rest of your life! Tomorrow's soup does not necessarily mean gazpacho and your main prep tool is not necessarily the refrigerator! Although this no-bake apple tart does require one. Raw food recipes are as diverse as vegetarian and vegan recipes. And raw simply means that you should never cook anything to a temperature of over 116° F.
If you're interested in learning more about a raw food diet this is an excellent place to start: The Raw Food Diet Solution. But, in the meantime, try this wonderful raw tart dessert recipe. Place 3 cups of chopped pecans in a blender or food processor and process until finely ground. Add 2 1/2 cups of raisins to the blender process until raisins are ground. Reintroduce the pecans to the blender and process until raisin and pecan mixture combines thoroughly. It may even ball up into a dough like mixture, depending on your equipment. Press the mixture into a 9 inch glass pie dish or any other pie pan of your choosing. Remove the apple mixture from the freezer bag and onto the tart crust. Distribute evenly. Place tart in the freezer for at least 30 minutes and remove about 20 or 30 minutes prior to serving. * A word about raw ingredients - we mentioned agave and there is some controversy relative to agave being a "raw" ingredient. You might want to look for the label that stipulates "raw agave" when shopping for your ingredients. 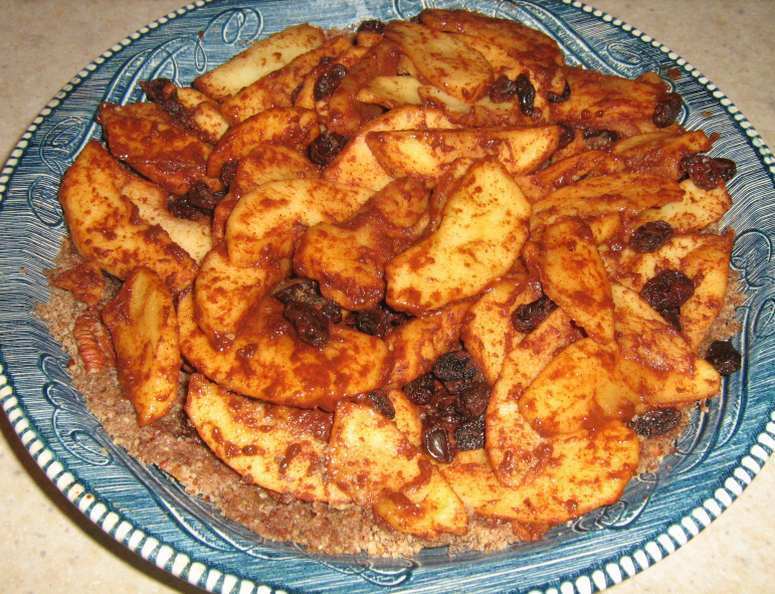 ** The reason for placing the apple mixture in the microwave is not to cook the apples but rather to soften them a little. If you have a dehydrator that will work even better as long as you plan ahead.